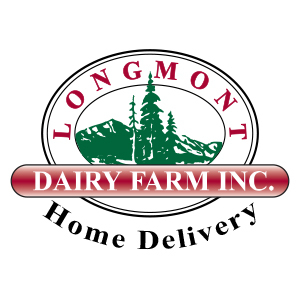 A recipe from Longmont Dairy customer Lois Blackwood. Her mom started making these, over 50 years ago, every year at Christmas. Makes about 64 bars. Preheat oven to 350° F. Line an 8” square pan with greased foil. Overlap edges of foil so it may be lifted from pan to facilitate cutting of bars. Melt chocolate and butter over hot water using a double boiler, blend together. Combine eggs and sugar. Beat until sugar is dissolved. Add flour to eggs, then nuts and chocolate mixture. Mix thoroughly. Add batter to pan and spread it evenly over the bottom. Bake on lower shelf 350° for 20 minutes. Transfer to center shelf of oven and continue to bake for another 5-10 minutes. Combine sugar and butter. 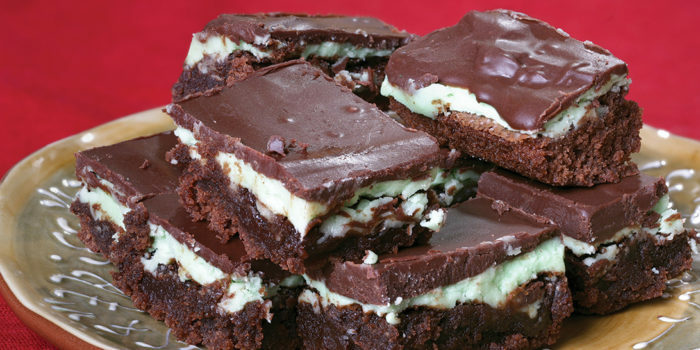 Mix until smooth, blend in cream and peppermint, and food coloring (if using). Spread on cooled first layout. Refrigerate and chill. Melt chocolate and butter over hot water using a double boiler, blend together. Spread over second layer as smoothly as possible. Refrigerate for 2 hours. Cut into 2” x 2” bars.